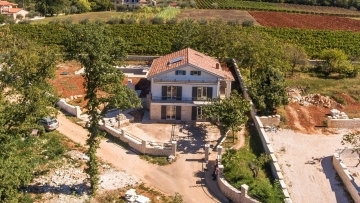 This newly built villa is equipped with the highest quality. It combines modern lifestyle and the charm of the region of Istria. On the ground floor there is a spacious living room and kitchen with dining area, guest toilet and technical room, on the first floor there are two rooms with two bathrooms and a large terrace. On the third floor there is a large room with a freestanding bath and a bathroom and a private terrace with panoramic views of the sea and the surrounding area. Restaurants and shops are within walking distance as well as the sea.